It's been a while since I picked a book for younger children, so this week's pick is courtesy of my almost 2 year old daughter. This girl LOVES books (almost as much as her Mama does) and her current favorite is Five Little Monkeys Jumping on the Bed by Eileen Christelow. 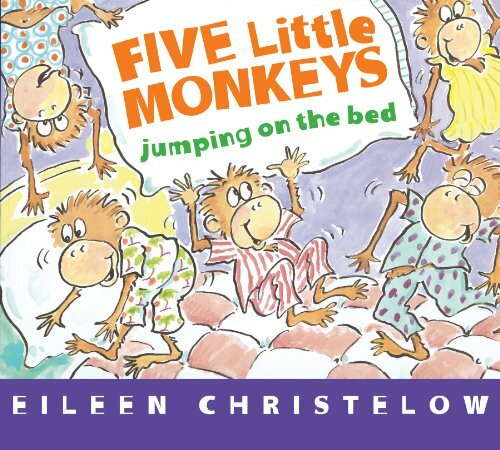 One of ten in a series of monkey books written by Eileen Christelow, this one tells how five rowdy little monkeys play instead of going to bed. It follows the sequence of the familiar rhyme, and I cannot help but read it with a singsong voice. Five LIttle Monkeys Jumping on the Bed is a perfect story for retelling, in fact one of my favorite things to do is sit and listen to my daughter "read" it while she flips through the pictures in her board book. She's speaking in two to four word sentences so she doesn't say every word, but you can certainly get the gist of what she's saying, especially when she shakes her finger and says, "No, no, jump!" when she gets to the part about what the doctor said. I also use this book (the paperback version) with my kindergarteners to introduce subtraction. My students draw a bed on construction paper and use cut out monkeys to act out the story as I read. I pause and my students help me write subtraction sentences after each monkey falls off the bed. Cute and versatile this book is a hit at home and in the classroom!